Product #22009 | SKU AH-XB-14-2 | 0.0 (no ratings yet) Thanks for your rating! The XB-14² by Allen & Heath is a broadcast mixer designed for self-operated broadcast applications in small radio and internet studios, as well as larger facilities with multiple rooms. It comes in a compact package and is packed with radio-friendly options usually found on large-format broadcast consoles. 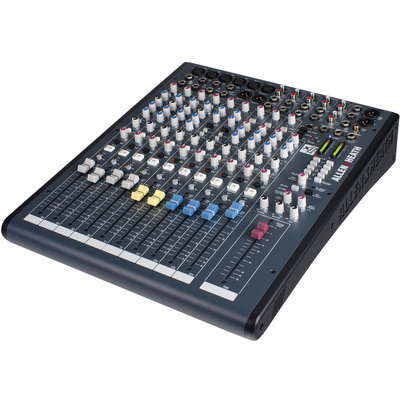 This Mixer allows for an efficient and flexible workflow with features such as telephone-communication (Telco) channels, fader-start sensing, automatic muting of speaker outputs, stereo channel-start/cue outputs for CD deck-transport control, separate headphone mixes for guests, an audition bus, and more. Separate monitor mixes can be created enabling the operator to cheque levels and cues without interfering with the listening sources of the presenter or guests. Using remote-interface connectors, mono channels can be remotely muted from studio-located mute or cough switches (available separately). In addition, the Talk to Guest switch allows for the operator to communicate off-air with guests, presenters, and telephone callers. The audio circuitry of the XB-14² features four mic/line channels equipped with high-gain DuoPre preamps and 3-band EQs to help cut sibilance & mic popping, and 2-band EQs on stereo channels for use with music. The full-duplex USB sound card offers playback and record to & from a computer as well as voice over IP (VoIP), and is compliant with Mac & Windows core audio drivers. The four mono channels feature DuoPre technology which employs a two-stage design to control the input gain structure of the channel. The first stage provides 69 dB of gain for the signal at the XLR input. The second stage is activated by plugging the signal into the TRS line-input jack. This gain-staging eliminates the need for pad circuit & pad switch, and ensures that the signal remains in the optimum region of its dynamic range for lower noise and distortion. The XB-14² is equipped with a stereo bi-directional sound card for playback, recording, or voice over IP (VoIP) to and from a computer. Its USB 1.1 audio codec is compliant with USB 2.0 ports and Windows & Mac core audio drivers. Two Telco channels provide a selectable clean-feed output (L/R PGM, Aux or audition bus), variable high-pass and low-pass filters which are useful when a caller is connected via a low-quality telephone line, and a talk button that allows for communication with a telephone caller without the presenter's voice going to the programme mix. The mono mic/line channels feature fader-start sensing to control external devices or to automatically mute speaker outputs to prevent feedback. The stereo channels are equipped with start & cue logic outputs used for CD deck transport control. Mic/line input channels can be remotely muted using an external "cough" switch (available separately). The XB-14² features individual vertically-mounted channel circuit boards with rotary controls fixed to the front panel using metal nuts. This robust construction allows for removing channels from the mixer one at a time and for easily changing faders, making servicing minimally disruptive.